Between 1934 and 1937 BMI produced auxiliary engines for use on a bicycle. The ca. 80cc engine had an automatic intake valve, a concept popular to about 1910; the intake petrol/air mixture is sucked into the cylinder when the piston travels downwards. Some 3500 of these engines were produced, although the design was very outdated. In 1937 it was decided to design a new engine, a 175 cc sidevalve concept and completely new cycle parts; a proper lightweight motorcycle. It was assumed that this design had never got further than the drawning table; as it appears now this machine is the prototype of the new design. It recently turned up among some machines that had been in storrage at the National Dutch Automobile Museum for years and were sold off as surplus items. 1937 BMI Zk Prototype, 175cc This machine has a Burman 3-speed gearbox and high level exhaust and silencer. Crankcase and cylinder are integrated in one cast-iron piece, cylinder head is aluminium and there is an outside flywheel. The sidevalves are placed in front of the engine. The BMI logo is visible on the tank, the headstock and the heat protection shield over the exhaust. 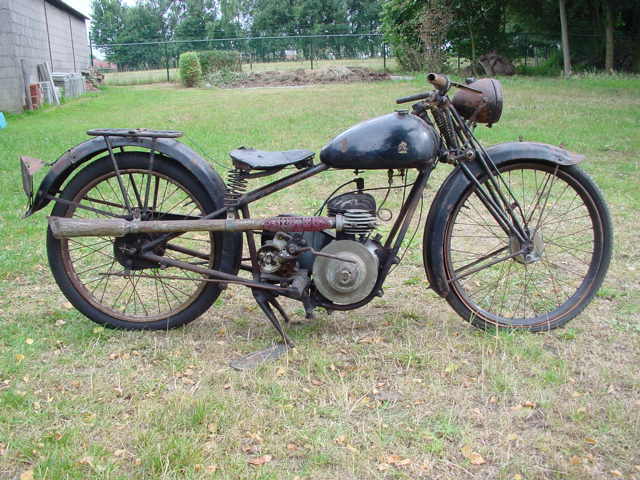 Truly a rare and remarkable piece of Dutch motorcycle history!